From the street they look like shipping containers stacked on top of each other. But the apartment block they are forming at Guildford in western Sydney is an innovative solution to the growing need for social and affordable housing in Sydney. Stackable modules that have been custom-made in China have been lifted into place in just two days for a four-storey building that will have 23 studio apartments, housing up to 36 people, including a caretaker, as well as a common room. The modules were built – complete with kitchens and bathrooms – as the foundations were laid, saving months of construction time. After being lifted into place by a crane and bolted together, they are being fitted with interior and exterior cladding and custom-designed furniture including fold-down beds before opening in July. 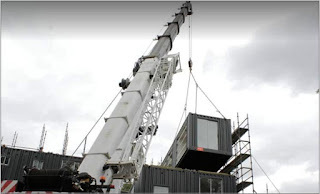 The general manager for developments delivery at Evolve Housing, David Risbey, said the modules were made of the same steel as shipping containers to fit a floorplan that includes a lift, stairs and hallways. Insulation, fans and cross ventilation via the building's windows will reduce heat in summer. So will residents feel like they are living in a shipping container? "No," Mr Risbey said. "You won't even know. Once the whole thing is clad, it will look like a conventional building." While this style of modular building is common in Europe, where extreme weather limits outdoor construction, it is rare in Sydney. 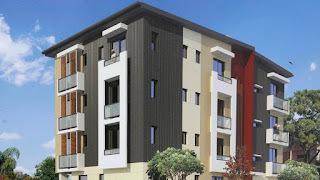 "We wanted to do this as a pilot to demonstrate that we can deliver quality housing earlier than a conventional construction project," Mr Risbey said. "You're probably looking at three to four months of construction that was done in two days.